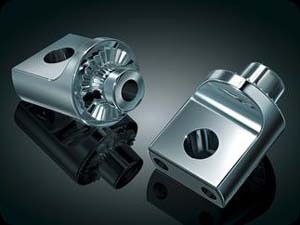 4351: Premium Style, quality, function, & adjustability at a price that can’t be beat. 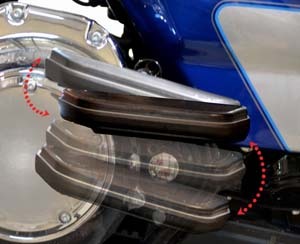 Switching to floorboards just got easier & with five thoughtfully placed splined mounts these boards can be fine tuned just right for the rider or passenger. 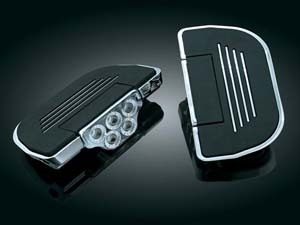 Available in two versions; Ribbed, featuring a wrinkle black finished base & Premium, featuring a brilliant chrome finished base with chrome inlays in the foot pad rubber. Part number 8883 required for installation (Sold Separately). 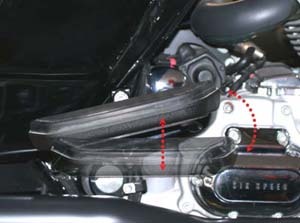 Fits: Installation on models in place of a male mount footpeg requires P/N 8883. 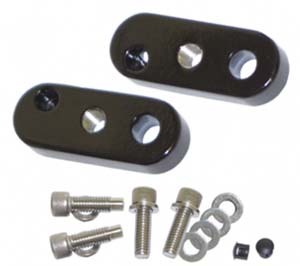 When used with Retractable Passenger Pegs (P/N 4352) NO Adapters are Required. 4357: Same as above but regular style. 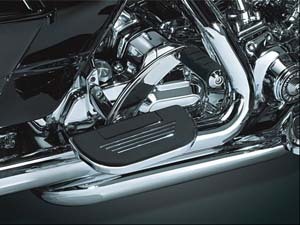 91-912: Tip the scales of style and function with these fresh designs now available with Harley 7/16” passenger mounts. 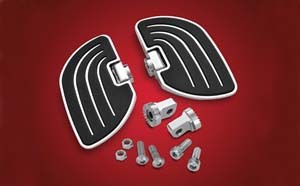 These boards fill the demands of motorcycles in style, comfort and performance. 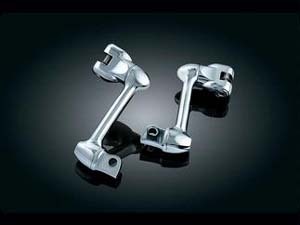 Made from forged aluminum, these boards are CNC milled for unparalleled strength and durability and finished with brilliant chrome. Each boardutilizes anti-rotation system mount to allow fitments in a 360° range and insure the boards will not pivot once secured. Generous board sizes allow for a comfortable foot rest for your passenger. 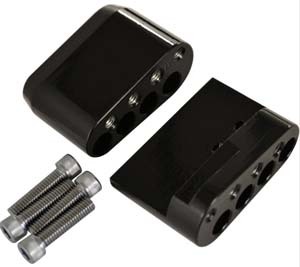 These boards are designed to fit allmodels with 7/16” male mount-style foot peg supports.Fits most touring bikes 1986 to current. 91-911: Similar to above with different styling. 91-910: Similar to above with different styling. 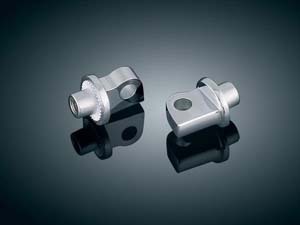 Adjustable Lockabe Offsets: Adjust your cruise or highway pegs 2” or 4” forward, back, up or down for perfect comfort. 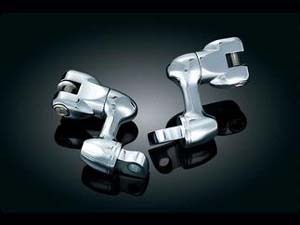 With 360 degrees of lockable adjustability, you can get your feet exactly where you want them. 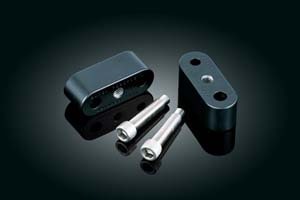 Simply mount the Adjustable Lockable Offset to footpeg mount, adjust the arm to desired foot position & lock them in place. Finish off with male mount Pegs. Offered in two lengths - 2" or 4"
4617: Not all passengers are created equal. Six combinations of height & tilt & up to 2 ½” of additional legroom ensure everyone gets to ride in comfort. Only minutes to install & adjust. 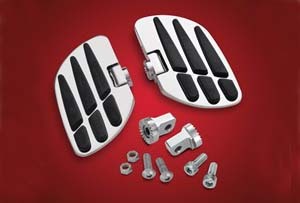 Fits '93 to '09 Electra Glides, Road Kings, Road Glides & Tour Glides equipped with passenger floorboards. Moves mounts further out by 3/4". BN-090-5: Utilizing your stock factory floorboards and this kit, your passenger can choose from any of six distinct positions, allowing them to personalize the floorboard to suit their comfort needs. Six "comfort" positions of height and tilt. 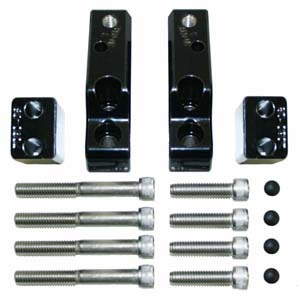 • HEIGHT: This kit provides two additional floorboard positions approximately 1.25" to 2" higher than the highest setting the stock floorboards currently provides. • TILTING: Places the floorboards on an ergonomic plane reliving stress in the legs and calves. 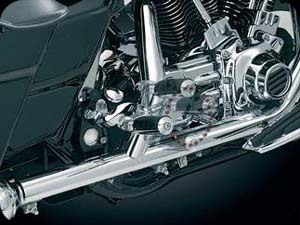 This tilted position provides passengers the ability to push into the boards when cornering providing them a more secure, "locked-in" feeling during aggressive riding conditions. 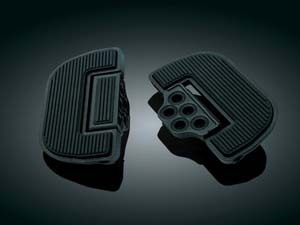 • SPACING: Provides two additional spacing widths, which add additional comfort for the passenger by spacing the floorboards wider apart. This allows them to let their lower body relax to a more natural position taking pressure off the inner thighs, knees and lower back. 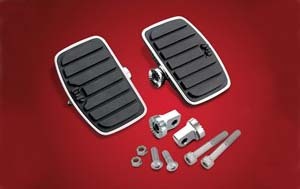 BN-090-10: Passenger floorboard comfort kit. 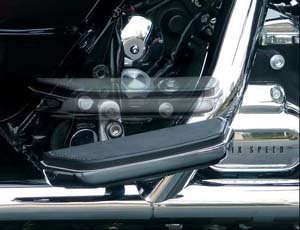 Fits: '10 – current all H-D passenger floorboard-equipped FL touring models. 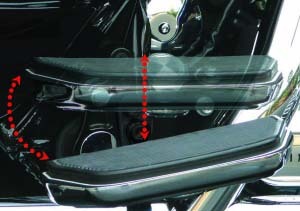 Two additional floorboard positions are provided; approximately 1 1/4 in. to 2 in. higher than the highest stock setting. 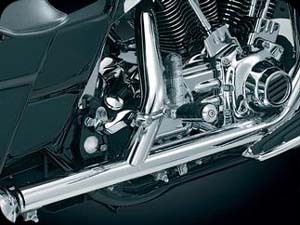 *Note: Can be used on the Trike model, but transmission in gear must be used instead of parking brake. 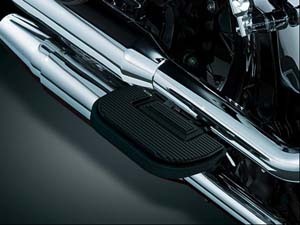 "Being able to adjust the passengers foot rest with the comfort kit saved my day. She wanted to come but wasn't all that happy with the sitting position. Now she is down right giddy. Goes everywhere."